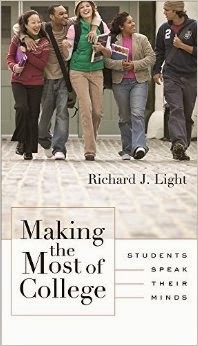 In Making the Most of College, Dr. Richard Light explains that writing has a higher impact on student engagement in a course than any other determining factor. “The results are stunning,” he says. The amount of writing students complete is more linked to their engagement in the course than time spent on the course, the intellectual challenge the course presents, the students’ level of interest, their impressions of the instructor, as well as whether or not the course is required. In short, if you want students to be engaged and learning, have them write more. Shorter papers are better than one longer paper. Light found that students who write four, five-page papers spend about 40 percent more time on their writing than students who were asked to submit one, 20-page paper. Have students write for each other, not just the instructor. Students who read and respond to each other’s work noted that doing so empowered them to explore new ideas and try new techniques with their writing. Focus writing assignments around a substantive course topic. Allow the students to explore content in-depth on their own, and provide feedback and support as they go through the process. If you would like assistance developing writing assignments or activities for your class, contact the Center for Teaching Excellence at 483-1680. Making the Most of College and many other titles are available for checkout from the CTE Library in Room 324 TLC.